The MCP16311/2 Design Analyzer is a simple Excel tool that provides you with a simple interface, laid out as predefined cells, in which various system parameters have to be defined (see figure below). The design analyzer estimates the static and dynamic behavior of the MCP16311/2 synchronous buck converter. By using this design tool, the engineering cost and schedule time can be reduced as the optimized final solution is reached in fewer iterations. In order to separate and define the fields clearly, the cells are color-coded. The cells corresponding to system input parameters are marked in green. In this field, the user has to define the input voltage, the output voltage, the maximum output current, the ambient temperature and the desired package type. Note that the system parameters are limited to the minimum and maximum values recommended for this section. Based on the parameters you enter into the System Parameters field, the Design Analyzer calculates the recommended inductor, output capacitor and feedback resistor values. These are displayed in yellow. Depending on the package type and ambient temperature selected by the user, the Design Analyzer will estimate the temperature of the switchers. 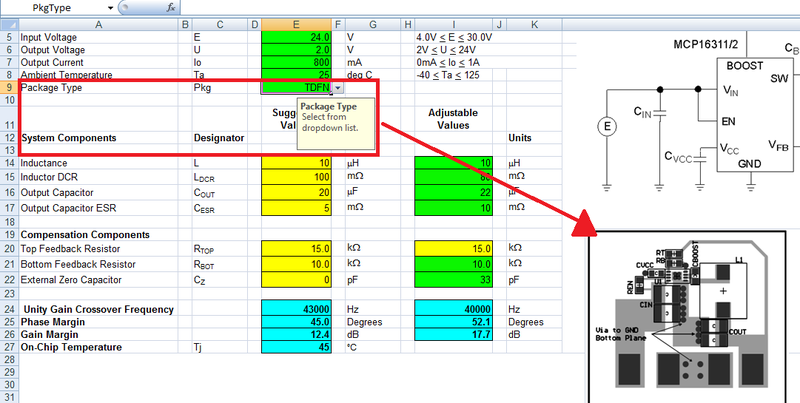 On the right side of the Design Analyzer, a typical schematic along with a recommended layout for each package type is displayed. In order for the results provided by the Design Analyzer to be as realistic as possible, you can try alternative component values based on the suggested values, and assess their overall effect on the system. All efficiency and stability analysis is done depending on the user-input adjustable values to minimize errors and ensure the best possible representation of the system’s performance. For the MCP16312, the PWM-only version, the Design Analyzer estimates the efficiency over the entire load range depending on the system parameters and user-selected system components. Because the PFM behavior is affected by both input voltage and output voltage as well as output current, it is difficult to estimate efficiency when running in PFM mode. You can tune the system components in order to achieve the targeted efficiency. The design analyzer provides information about the expected stability and dynamic performance of the converter through the bode plot of the closed loop system. A bode plot is a graph of a transfer function, and it represents the magnitude (expressed in decibels) and phase (expressed in degrees) of the transfer function plotted on a logarithmic frequency scale. The design analyzer should not substitute proper in-system verification and validation entirely, but rather help facilitate these processes only.